It’s apt that artist and filmmaker Harun Farocki’s recent solo show at London’s Raven Row was couched between Artillery Passage and Gun Street in the city’s financial district. Outside that gallery’s walls, tall steel and glass buildings are material reminders of crumbling businesses and capital’s auto-destructive and extravagantly mediatized downfall. Visitors entered the gallery and were confronted with an artist’s lifelong project, which — through an exacting use of archival footage and digital, animated, and filmed images — demonstrated as well as critiqued precisely the means by which those technologies of power operate, the worldviews and imaginaries they impose, and the concomitant possibilities of reframing both through montage and text. The solo show ran alongside a retrospective of twenty-two Farocki films shown at the Tate Modern and a monograph edited by artists Antje Ehmann and Kodwo Eshun of the Otolith Group. In nine film and video installations distributed across three levels, Farocki’s obsession with global capitalism’s mathematical, mechanistic operations of surveillance, control, and destruction came to the fore. Recurring themes were: the apparatus of war, the US military’s reconnaissance technology, the mechanized collection of data on consumers in supermarkets and inmates in penitentiaries, and the automation of industry and labor. 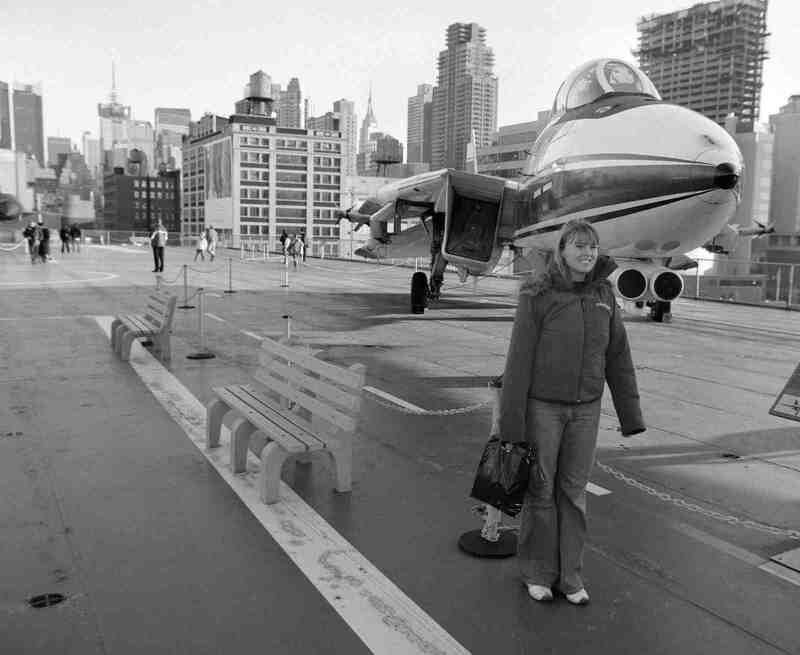 Much in the same manner that Chris Marker turned the cinematic mechanism into what Jonathan Kear has dubbed a “machine that quotes from the past,” snatching and recombining images and somehow interrupting the flow of time, Farocki’s films formed juxtapositions that provoked thought (and quite a bit of anger and disbelief), rather than producing a seamless linear narrative. His lyrical, meticulous, and sober engagement perhaps indicated that Farocki isn’t concerned with those modes of oppression and representation in a polemical or combative way — at least, not anymore. It was interesting that the film installations on show at Raven Row belonged to Farocki’s more recent work and appeared perfectly suited for a gallery setting. Since his films usually belong to the genre of film essays within the world of cinema, this begged the question of whether the multiscreen works were themselves informed by shifts in the moving image’s exhibition format, or whether the show’s curatorial voice was also lucid and sensitive to Farocki’s relatively new but necessary place in the contemporary art world, thereby influencing the choice of work and its arrangement throughout the space. At the very least, the gallery format allowed for the exploration of old and new connections between various pieces of his practice over the years. 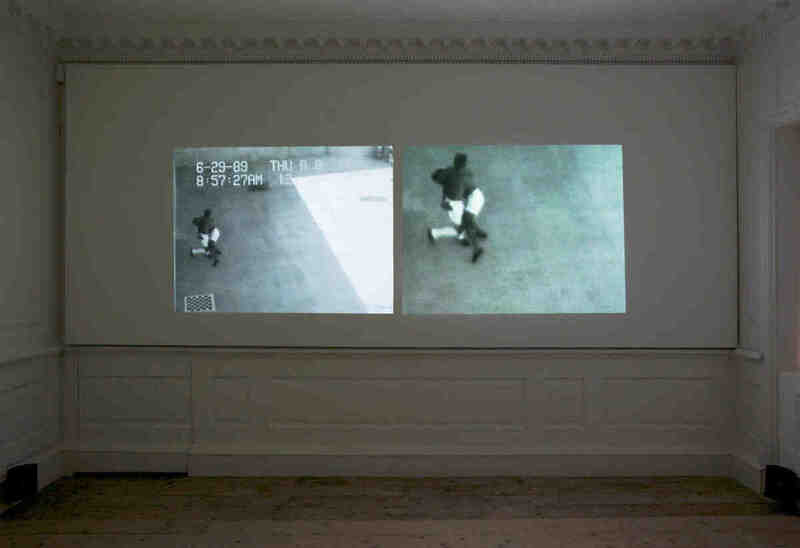 Take, for example, the two-screen video projections I Thought I was Seeing Convicts (2000), Eye/Machine III (2003), and Immersion (2009), which had more in common than the large, split-screen format that he’s used elsewhere; the images used in them were produced without direct human intervention. Using CCTV footage from the Corcoran State Prison in California, digital animation from virtual reality immersion therapy used to treat Iraq war veterans, and the so-called intelligent images from laser-guided smart bombs and cruise missiles, the three films highlighted the way panoptic imagery is produced for the purposes of security and control (and cannot but end in the death of those it is purported to monitor and pursue). Images of images, these works evoked an archaeological practice, inasmuch as they dug up, mapped, and interrogated the use of imaging technology in the exercise of control. Farocki calls such images “operative images,” in that they’re neither informative nor representative but form part of the technical operations that go hand in hand with brutality. Still, the archival images in Farocki’s film installations, as well as his other films more generally, didn’t function as mere artifacts. Not only did the split-screen and multiscreen images comment on each other, but Farocki’s textual commentary in the form of intertext and/or voiceover also allowed us to revisit and reread archival footage anew. As he explained in the outstanding film Interface (1995), Farocki spends years looking at certain images, as an art historian might, until he discovers something else, virtually “resurrecting” or reclaiming the material. 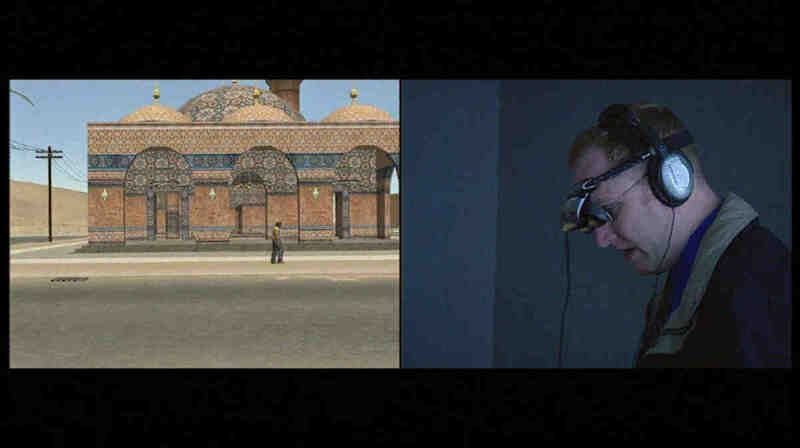 Shown on two adjacent TV monitors, with poignant voiceover narrations, in which he referred to himself as an author who brings to life the stories handed down to him, Interface zoomed — in a quasi-Godardian methodological manner — into the philosophy and mechanics of Farocki’s research-based, manual practice and editing lab. Quoting archival footage from previous films and film preparations — from the Dow Chemical company, which produced napalm in the 1960s and about which he made the unforgettable film Inextinguishable Fire (1969), also shown at the Tate — as well as numerous images of himself in front of his work desk and editing suite, Farocki mused over notions of editing as metaphor, claiming that the invention of cinema came one hundred years too late, when Europe had already occupied most of the world and, thus, the images of the world. Purportedly inspired by Allan Sekula’s photographic series War without Bodies (1991–1996), Transmission (2007) consisted of images (filmed by Farocki this time) of pilgrims flocking to the Vietnam Memorial in Washington, DC; the Buchenwald concentration camp memorial plaque; the Church of St. Mary in Munich, where the devil’s footprint is said to exist; the imprint of the hand of Christ at the Via Dolorosa in Jerusalem; the open-mouthed marble statue of the river god Triton. What these places have in common — aside from the human fascination with permanence — is the way pilgrims continually touch the stones, plaques, and names in the hope of infusing the matter with their own memories and desires. Farocki’s method of progressively “breaking open” images by repeatedly watching and studying them became apparent as he showed us the sites again and again, as if in a loop. Each set of locations and pilgrims was interrupted with textual commentary onscreen, which grew more precise and personal each time, until eventually the last meaning assigned to the image was quite different from, and more chilling than, the one we first constructed. For Farocki, it might be that the stones and metal plaques have the same properties as images, in that they behold both memory and forgetfulness. Just as it was said that the distinctive filmmakers Jean-Marie Straub and Danielle Huillet (who worked as husband and wife) questioned the transformation of painting and literature into film as a way of rereading, readjusting, and reinventing meaning, the same can be said of Farocki’s use of film archives, through his utilization of speech and montage. In the same way their work has been said to halt easy access to an original text and to their artwork more generally, so too do Farocki’s film essays, in their sometimes durational, sometimes untranslated form. In fact, most of the works on show at Raven Row — many of which lasted no less than twenty-four minutes — pushed the boundaries of habitual, lazy spectatorship. Future film projects include charting — and most likely critiquing — the use of virtual reality headsets and robotic hands by those in positions of power, whom, needless to say, Farocki’s films and writings have always held in the highest contempt.